Cotton is a crop that is majorly used in textile industries. It is a perennial crop that is harvested in moderate rainfall and during a frost-free period with plenty of sunshine. Cotton is a leading cash crop in the US and is a labor-intensive farm crop. It is somewhat salt- and drought-tolerant, which makes it an attractive crop for the arid and semi-arid regions. However, the major problem with the cotton crop is its pest control, extensive farming, and labor requirement. The global cotton consumption is estimated to register a CAGR of 2.0%, during the forecast period. However, world production is expected to grow at a slower pace than consumption during the forecast period due to falling price trend in the international market. Global cotton exports were worth USD 52.77 billion in the year 2016, which was a decline of 6.4% from the year 2015. China is the largest exporter of cotton in the world and it exported USD 14.96 billion worth of cotton in the year 2016. Some of the significant cotton producing countries are China, India, Pakistan, and USA. Cotton is commercially used in various forms as cotton fiber, cottonseed, and cottonseed oil. Around 64% of the cotton is used for apparel, 28% for home furnishing, and 8% for industrial use. Cottonseed is mainly consumed in the animal feed industry for compound feed purposes. In the food industry, cotton is utilized in the form of cottonseed oil as a refined vegetable oil in various food products. 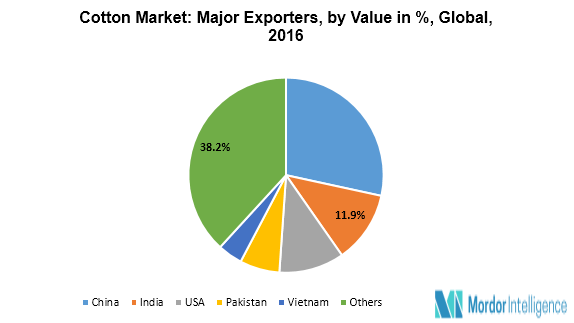 China, US, and India are the major producers of cotton, followed by Pakistan, Brazil, and Uzbekistan. China leads the global production and exports market. In the US, most of the cotton produced is exported due to the less developed textile industry in the country. Asia-Pacific dominates the global production but most of the cotton produced is domestically consumed. China holds the largest market share of 29% of the world cotton production and around 49% of the milled cotton used in the country. Similarly, in India, the dominance of textile sector prevails, as it consumes most of the cotton produced in the country.